The Markilux 660 and 620 vertical blinds with the new ZIP system are remarkably strong, stable and quiet in windy conditions. The 620 ZIP is a non-tensioned version of the 680 that is suitable when higher winds are not a consideration. 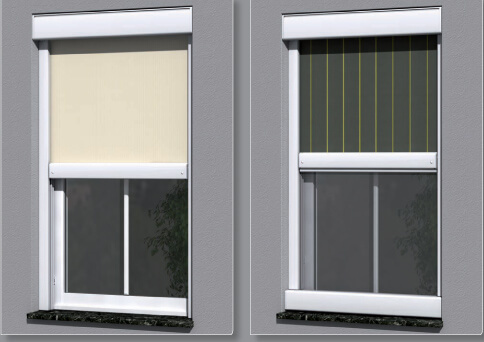 The ZIP system provides a completely closed appearance for a more refined look to the installed vertical blind. Elimination of the gap between the cover and guide tracks also provides the strongest wind resistance, which can be guaranteed to Beaufort force 8 (39-46 mph), as well as reduced noise in windy conditions. But to understand how remarkably strong the ZIP system is in high wind conditions, please view these short videos of the wind tunnel testing of the 620 ZIP in both the frontal and side wind tests. The awning remained fully in tact up to winds of 125 mph (200 kph)–well beyond anything your awning would have to endure! The 660 and 620 ZIP vertical cassette blind is custom-sized to your exact specifications. The minimum width is 23″ and maximum width is 9’8″. The minimum height is 31″ and the maximum height is 9’8″. The 660 and 620 Zip solar screen comes standard with a hard wired motor for ease of operation and can be optionally equipped with a remote control operation for maximum convenience and flexibility. There are numerous Designer High-Tech Fabric selections for this vertical blind, including Sunsilk SNC (nano-clean), Acrylic, Perfotex and Transolair, which blocks the sun but keeps the view. The cassette and frame comes in three standard colors (white, metallic aluminum and grey brown) as well as many optional powder-coated color choices. Our staff will help you select the ideal fabric and cassette color for your decor and performance requirements. Please click the link below to download the complete specification and installation guide for the Markilux 660 ZIP Vertical Cassette Blind. The guide tracks can be fixed directly to the wall, the window frame or the reveal. When fitted with a fly screen, the frame is closed at the bottom. 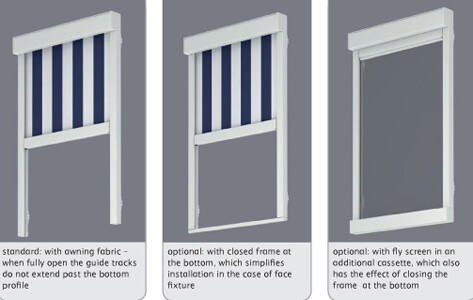 Shown below are the standard configuration, the optional closed frame at the bottom and the optional fly screen installation.